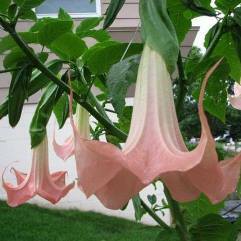 Brugmansia are large shrubs or small trees, reaching heights of 3-11 m, with tan, slightly rough bark. The leaves are alternate, generally large, 10-30 cm long and 4-18 cm broad, with an entire or coarsely toothed margin, and are covered with fine hairs. 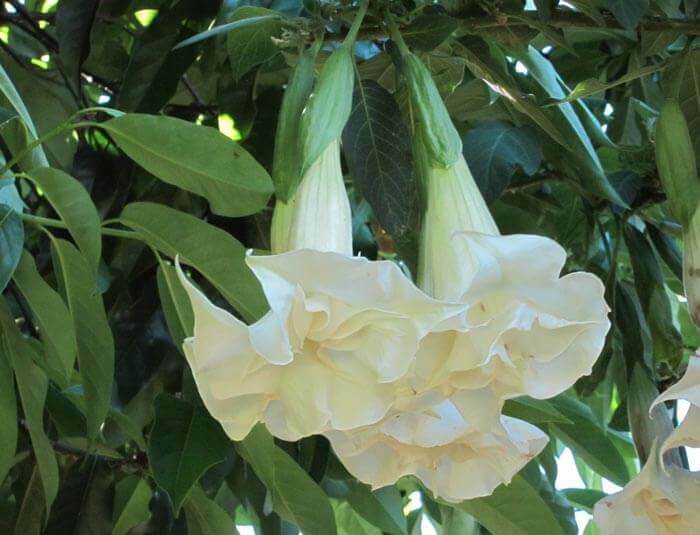 The flower trumpet refers to the large, very dramatic, pendulous trumpet-shaped flowers, 14-50 cm long and 10-35 cm across at the wide end. 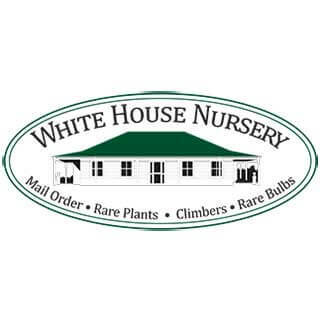 They are white, yellow, pink, orange or red, and have a delicate, attractive scent with light, lemony overtones, most noticeable in early evening. Flowers may be single or double. Large Frilly Pink - Flowers late spring, summer and autumn. 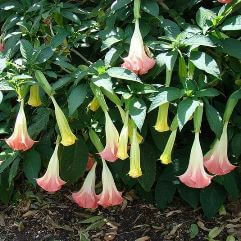 Soft pink trumpet with a white throat. Slight evening perfume. Rosea - Flowers late spring, summer and autumn. 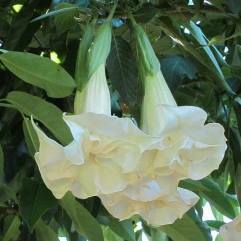 Soft pink trumpet with a white throat. Slight evening perfume. Grand Marnier - Flowers late spring, summer and autumn. 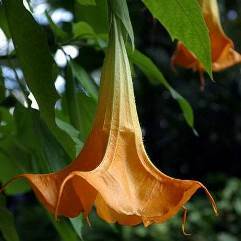 Tan/Apricot trumpet. Slight evening perfume. Aztec Gold - Flowers late spring, summer & autumn. Orange/Yellow trumpet with a small white throat. Slight evening perfume.